 Since in Line 1, Wodiyeya Deminiya l is followed by the number 1, this can only be one person. Thus, her name is  Wodiyeya Deminiya. * Mano * and * Pukaro * are men's names. Line 11 also refers to only 1 person, but the name of the person is truncated, i.e. it no longer appears on the tablet. This tablet is one of those rarities of rarities, a Linear B tablet from Mycenae, where so few tablets h ave been unearthed, in spite of the fact that it was the major military centre of the Mycenaean Empire. Unfortunately, so much of  the text on this tablet is illegible that it is very difficult to make much sense of it. Most of the vocabulary cannot even be found in the excellent Linear B Lexicon by Chris Tselentis. But I have done my best! 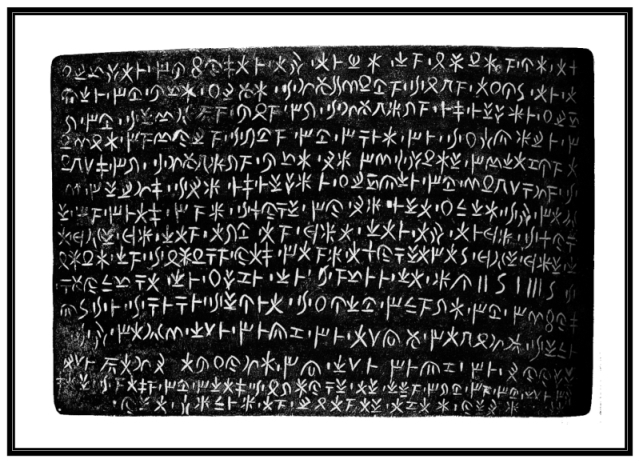 THIS IS A MAJOR ARTICLE ON MYCENAEAN LINEAR B & ON THE NEWEST AND MOST ACCURATE TRANSLATION EVER OF PYLOS TABLET 641-1952 (VENTRIS), THE VERY FIRST TABLET EVER TRANSLATED, BY MICHAEL VENTRIS HIMSELF, IN MYCENAEAN LINEAR B. In partnership with The Association of Historical Studies, Koryvantes (Athens), our organization,Linear B, Knossos & Mycenae (WordPress), conducts ongoing research into Mycenaean archaeology and military aff airs and the Mycenaean Greek dialect. This study centres on a fresh new decipherment of Pylos tablet TA 641-1952 (Ventris) by Mrs. Rita Roberts from Crete, who brings to bear the unique perspectives of an archaeologist on her translation, in all probability the most accurate realized to date. We then introduce the newly minted term in Mycenaean Linear B, the supersyllabogram, being the first syllabogram or first syllable of any word or entire phrase in Linear B. Supersyllabograms have been erroneously referred to as “adjuncts” in previous linguistic research into Mycenaean Linear B. This article demonstrates that their functionality significantly exceeds such limitations, and that the supersyllabogram must be fully accounted for as a unique and discrete phenomenon without which any approach to the interpretation of the Linear B syllabary is at best incomplete, and at worse, severely handicapped. KEYWORDS: MYCENAEAN LINEAR B, SYLLABOGRAMS, LOGOGRAMS, IDEOGRAMS, SUPERSYLLABOGRAMS, ADJUNCTS, LINEAR B TABLETS, PYLOS, PYLOS TA 641-1952 (VENTRIS),DECIPHERMENT, TRANSLATION, POTTERY, VESSELS, TRIPODS, CAULDRONS, AMPHORAE, KYLIXES, CUPS, GOBLETS. Rita Roberts’ elegant translation of Knossos tablet KN 1548 Ok 02. Once again, Rita Roberts has finessed a translation of an intact military tablet from Knossos. It is significant that Rita mentions that the hilt is directly riveted, whether to ivory overlaid on terebinth, or to the terebinth itself. Although the tablet does not explicitly mention rivets, it is obvious that this was the method the highly skilled Mycenaean sword craftsmen used to attached the blade to the hilt. The following figures clearly illustrate the marked accuracy of her translation. Notice in particular the blue stones inlaid in the ivory on the second and third swords in figure 2, and especially in the second. If these stones are lapis lazuli, as I strongly suspect they are, then it follows almost as night follows day that the second sword in particular could only have been reserved for the wanax — transliterated from the Greek into Latin letters for those of you who cannot read Greek — (called wanaka in Linear B), the King of Mycenae, since lapis lazuli was worth a fortune in those days. The second sword could also have been his, though it may also have been the property of the second leader in the Mycenaean hierarchy, the lawaketa, or lawagetas (likewise transliterated into Latin letters) or the leader of the host, in other words the commander-in-chief, the general. I would bet my top dollars on this presumption. I wonder whether Rita would too. This tablet, which is very long, and in splendid condition, being cast in bronze, is a legal decree composed in the fifth century BCE. Although its publication comes much later than the fall of Mycenae ca. 1200 BCE, it is well known that the Arcado-Cypriot dialect was written in Linear C as early as 1100 BCE, a mere 100 years later (!) than the sudden disappearance of Linear B, even though there are no extant documents from that time. The vital point here is that neither Mycenaean Greek nor Arcado-Cypriot underwent any significant changes at all during their primacy, the former between ca. 1600 & 1200 BCE, the latter between 1100 & 400 BCE. 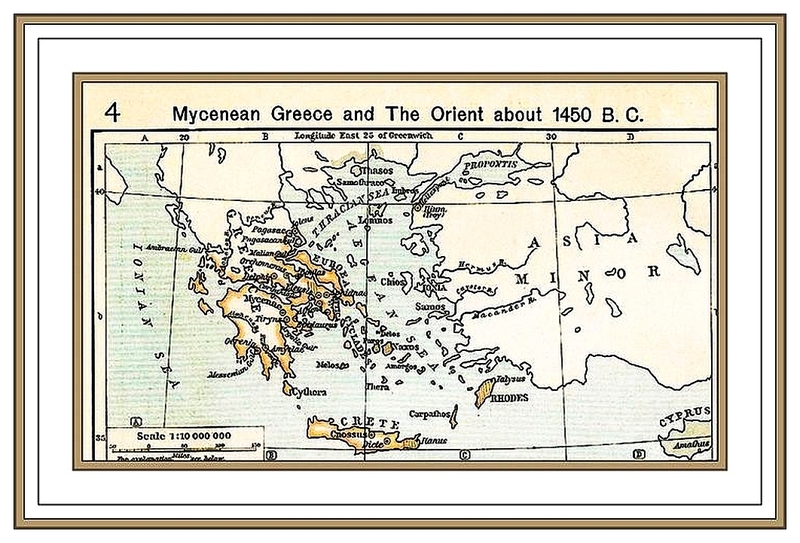 They remained almost virtually unchanged, the latter in spite of the Dorian invasions around 1200-1100 BCE, which had no visible effect whatsoever on either Arcado-Cypriot or its slightly older forbear and kissing cousin, Mycenaean Greek, both firmly encamped in the family of East Greek dialects. Dorian Greek was an entirely different kettle of fish, being strictly a West Greek dialect. Linguists, experts in ancient Greek dialects, have confirmed this over and over throughout the twentieth century into the twenty-first. In fact, the consensus is universal on the extremely close bond between these two East Greek, proto-Ionic dialects, because how on earth can it be otherwise? An orange is an orange, and a tangerine is a tangerine. They are both in the same class. But Dorian, a West Greek dialect, is no more related to our East Greek cousins than an apple is to either an orange or a tangerine. Yes, they are both fruit, but that is where the similarity ends. which you should read in its entirety. In it, two eminent linguists in ancient Greek, virtually agree on every single point, even though they are writing 60 years apart, the one, C.D. Buck, in 1955, and the other, E.J. Bakker, whose intensive study of the ancient Greek dialects was just released this year (2014). This is the consensus pretty much across the board. It is extremely difficult, if not downright impossible, to divorce these two dialects from one another. If anything, there is only annulment between West Greek Dorian, and East Greek Mycenaean and Arcado-Cypriot. The former, which only gained the ascendancy in its own sphere of influence, the Peloponnese, after the Dorian invasions ca. 1200 BCE, had virtually no effect at all on Mycenaean Greek, simply because that is impossible, Mycenaean Greek having predated Dorian Greek by at least 400 years! Besides, Mycenae fell either before the Dorians arrived on the scene, or because the Dorians themselves destroyed their civilization. But even this latter scenario is highly improbable, for this sole reason if none other. 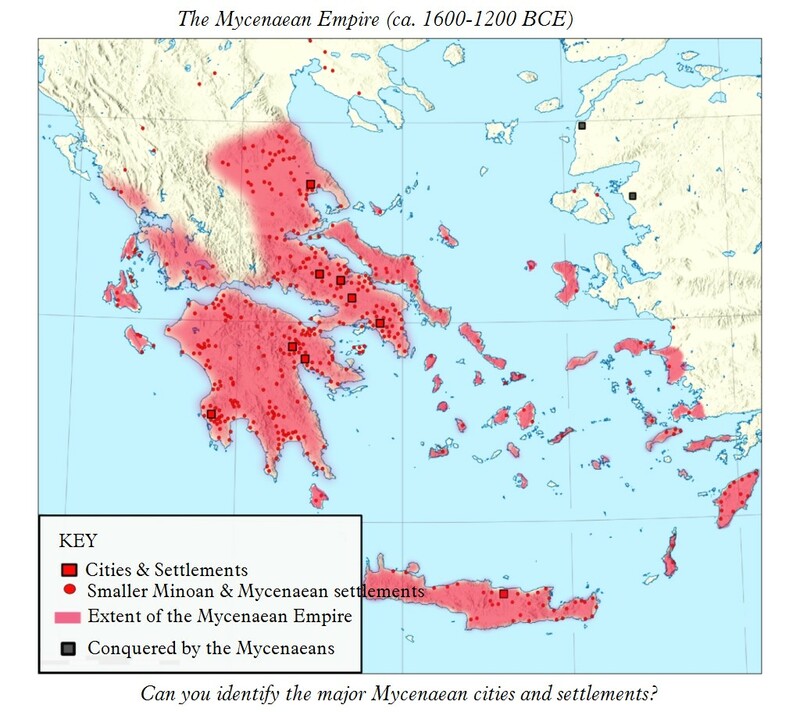 Since all of the Mycenaean cities collapsed at the same time (give or take a few years), I have to seriously question how the Dorians could possibly have toppled all of them, when for instance, Thebes, in far-flung north-eastern Greece, was so far away from the Peloponnese that they, the Dorians, would have had to trek all across Greece just to get there. An improbability, if not an impossibility, considering the horrendously difficult conditions for long distance travel in those days, even – or should I say – except at a snail’s pace. 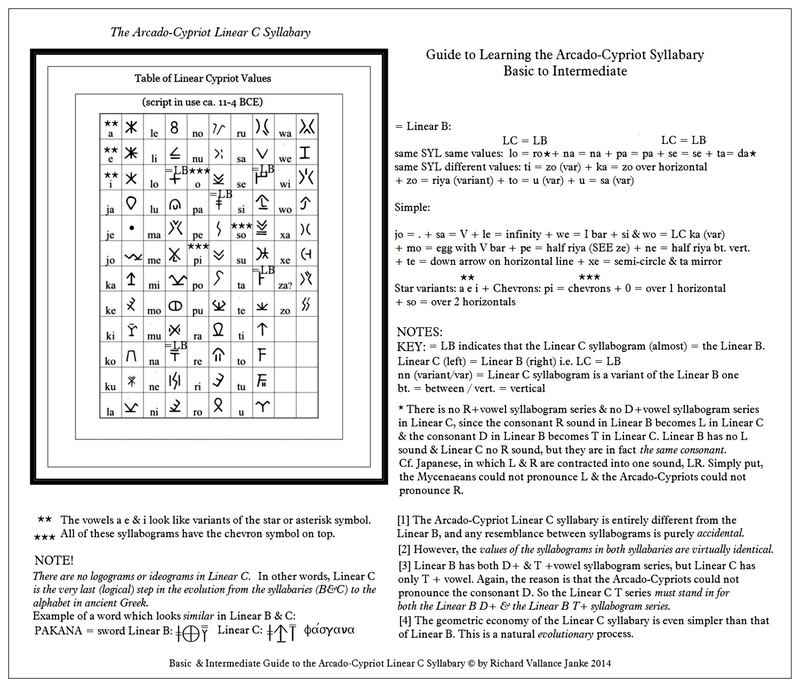 Once I have mastered Linear C, which is going to be very soon (early 2015), I shall translate the entire Idalion tablet, and at least 3 other Linear C tablets into English, and even supply the alphabetical Cypriot text of the tablet. Oh, and by the way, if anyone questions the even tighter relationship between the northern Arcadian dialect on the Peloponnese, and its far-flung sister, Cypriot, on Cyprus, in the south-east Mediterranean, think again. With the exception of a few piddly differences, they are virtually identical, all the more astonishingly that their locales are so far apart (See travel in the ancient world above). But it does not end there. Mycenaean Greek & Arcado-Cypriot, both East Greek dialects, are even more similar than Ionic & Attic Greek! That is one tough act to follow. There is at least one modern researcher and translator of Linear B tablets who attempts to correlate Mycenaean with Doric Greek vocabulary, and at that, quite frequently. This is a dangerous path to pursue, fraught with hazards from which it would be difficult, even in the best of scenarios, to extricate oneself without becoming mired in blatant contradictions leading inexorably to a reductio ad absurdum. I have the greatest respect for this linguist, who has roundly criticized me and soundly corrected me on at least three of my more dubious, if not down-right silly translations of Linear B tablets, and for this I am truly grateful. Yet to pursue a path that will lead nowhere but to an irresolvable impasse seems very much like Don Quixote’s tilting at windmills. While I applaud, though with some serious reservations, this person’s highly imaginative approach to deciphering Linear B, the methodology is bound to turn all Linear B research on its head, and to largely invalidate the corpus of Linear B translations to date almost in its entirety... let alone the astonishing achievements of Michael Ventris in the first place. I am certainly not advocating that any researcher-translator of Linear B cannot do precisely that, but if he or she does, that person will have a heck of a lot of explaining & justifications to advance, and above all, will have to provide proof-positive (no loopholes please!) that his or her hypotheses or, if you like, entire theory, flies or crashes. Not only that, such a translator would have to convince the vast majority of contemporary linguists expert in Linear B decipherment and translation that such a drastic shift in the tectonics of the translation of Linear B does in fact constitute a truly significant, meaningful revolution in our understanding of the script and of the East Greek dialect, Mycenaean Greek, which is its underpinning. I sincerely believe that my own research, which goes in the exact opposite direction, directly correlating the (striking) similarities between a relatively large cross-section of Mycenaean vocabulary in Linear B and Arcado-Cypriot in Linear C (I expect at least 100-200 words), will serve to throw a huge wrench into any approach which attempts to correlate Mycenaean East Greek in any significant way with Dorian West Greek, and which is highly likely to invalidate said approach once and for all. Of course, my approach, my hypotheses, my theory and my methodology must also stand the test of sound critical appraisal from the international community of Linear B linguists. If my theory does not pass muster with the majority of Linear B experts, so be it. There it ends. As an aside, allow me to point out that I shall be pursuing a very similar route starting in October, and continuing on through the end of this year and probably beyond, as I translate the entire Catalogue of Ships from Book II of the Iliad, the very section of that astonishing Epic in which Homer makes frequent use of the most archaic Greek in the entire Iliad. This translation will confirm (because all others have to date) that a strong correlation also exists between his archaic Greek, almost certainly harkening back to at least the ninth century BCE, if not beyond, and Mycenaean Greek, upon which it is firmly founded. That exercise, in and of itself, will serve just as well as the present on Mycenaean & Arcado-Cypriot, to confirm that Mycenaean Greek has strong bonds, not only with Arcado-Cypriot, but with the most archaic Greek in the Iliad. And it does not end there either. If confirmation is pending between the close affinity of Homer’s archaic Greek and Arcado-Cypriot, that circumstance alone will only serve to strengthen my hypotheses, and the theory underpinning them, as outlined above. I sincerely believe and confidently trust it will. 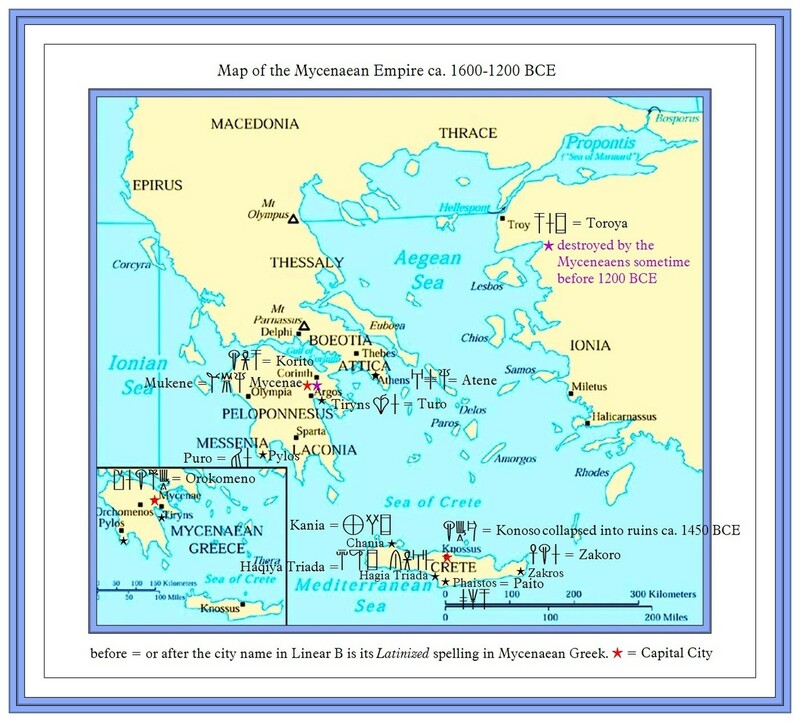 A Map of the Mycenaean Empire & a Quiz? Whoever guesses the largest number correct names of the major Mycenaean cities and settlements on this map (those tagged with a RED SQUARE), and the name of least one of the cities they conquered (tagged with a BLACK SQUARE) will win a beautiful set of 50 photos I took of ruins at Ephesis, Pergamon, Knossos, Mycenae & Epidaurus on my fabulous vacation in the Mediterranean in May 2012. 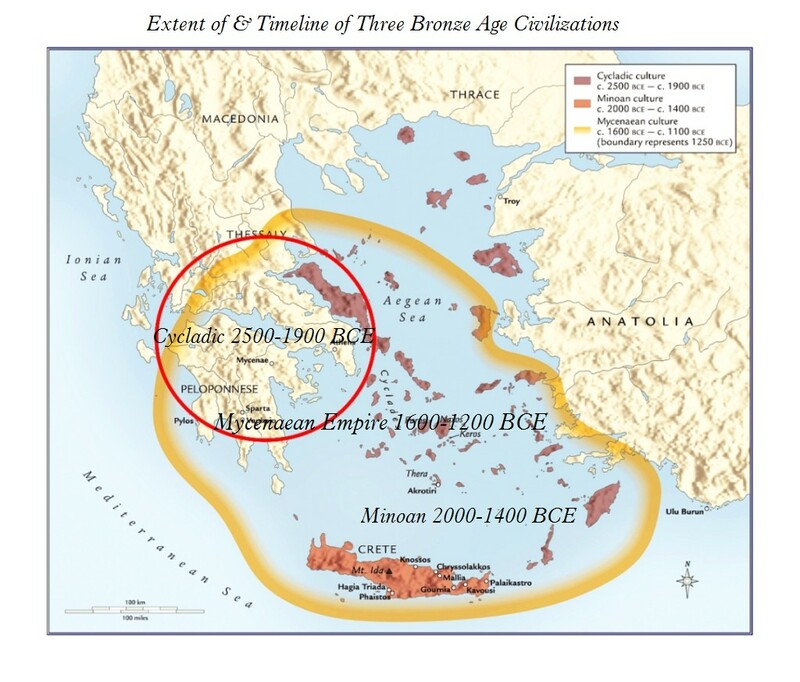 A Series of Maps of the Minoan & Mycenaean Empires: Part B – 4 more maps & a Quiz! 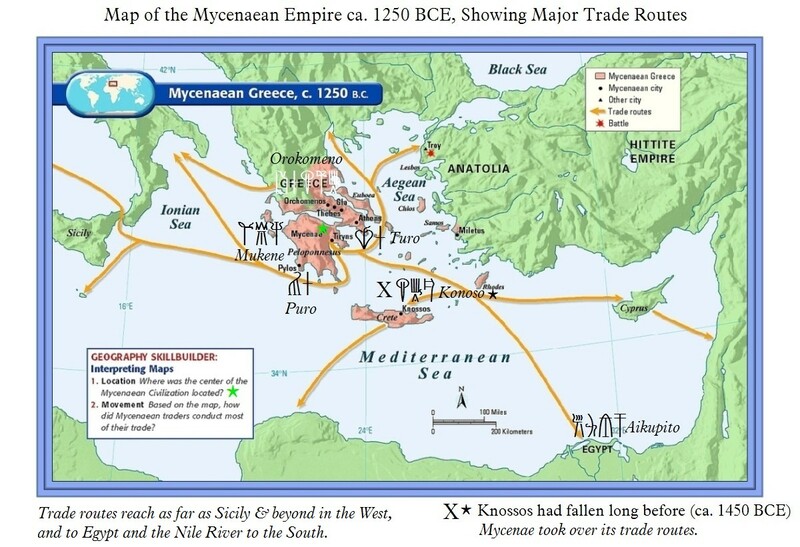 This is the second and last series of maps of the Mycenaean Empire. It is a bit of a misnomer to refer to a Minoan Empire, except in the sense of their extensive network of trade with Egypt, Syria, Cyprus, Sicily and beyond, Athens, Troy & the west coast of Asia, where the modern nation of Turkey now exists. 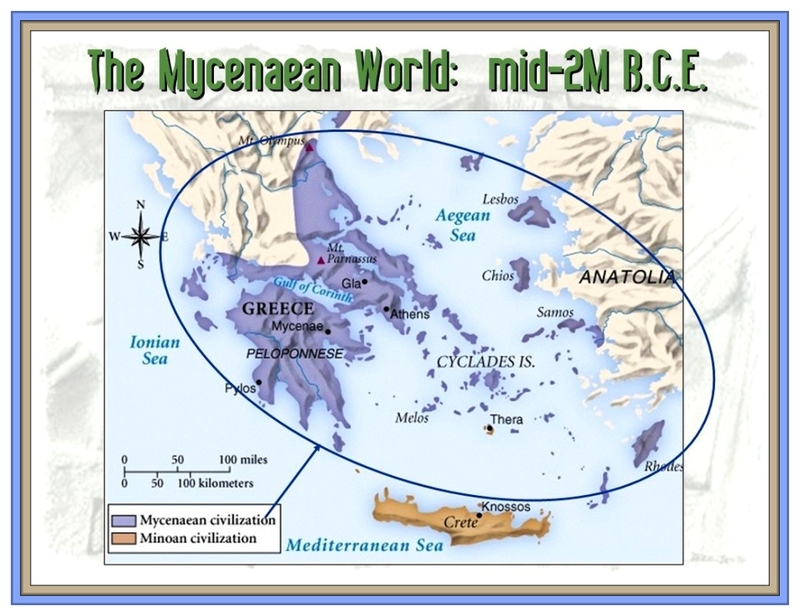 These 2 first maps illustrate the wide extent of the Mycenaean Empire, which was no paltry thing, being pretty much as large as the Athenian Empire at its height in the sixth century BCE, some 600 years after the fall of Mycenae. Ha, ha! You thought the Quiz was in this post. Nope. You will have to look at the maps in the next two posts to find the correct map. 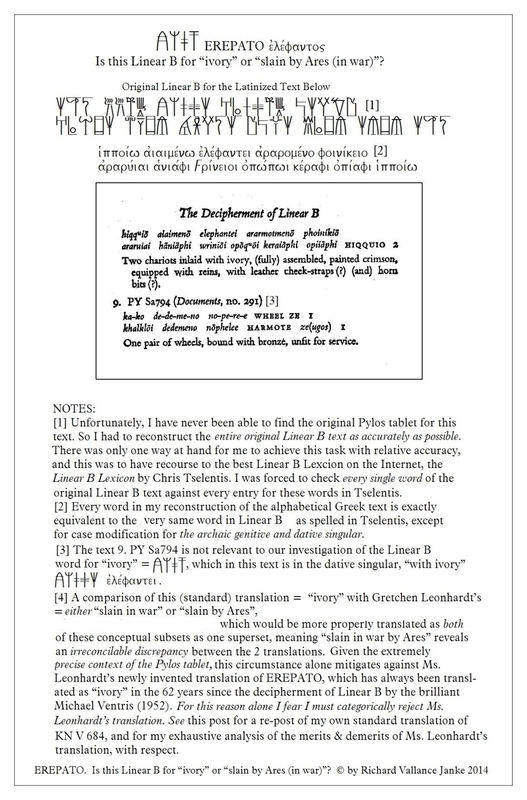 From the very outset, when I ran across Ms. Gretchen Leonhardt’s highly unusual, irregular translation for the Mycenaean Greek word in Linear B, EREPATO (here latinized for most folks visiting our blog, who cannot read Linear B), my first reaction was to be totally confused, bordering on dazed. I just couldn’t wrap this decidedly esoteric translation around my head. I was stumped. 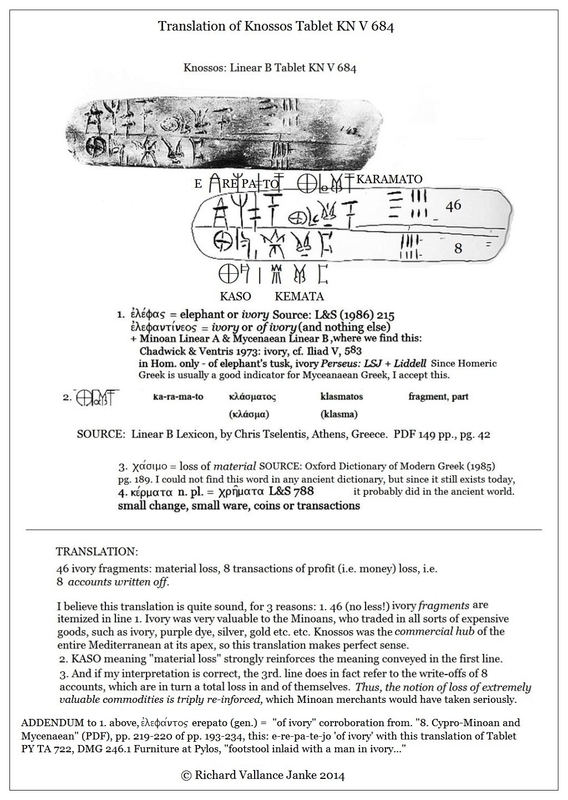 Was Ms. Leonhardt on to something no other researcher has even remotely entertained as a possible translation of EREPATO in the past 62 years since the decipherment of Linear B by the brilliant Michael Ventris? OK, I thought, I will give her the benefit of the doubt, but when my own doubts starting piling up one on top of the other, the benefit of the doubt simply vanished in a puff of smoke. I hasten to add that my doubts as a Linear B researcher and translator, hopefully as adept as Ms. Leonhardt most certainly is, over her newly coined decipherment of this one word alone are founded, not on mere speculation, but on truly practical, experimental and logical factors which together conspire to cast serious doubt on, if not almost certain evidence strongly mitigating against such a translation. To put a fine point on it, either one or the other of our translations, but not both, can reasonably be said to be close to the mark if not on it. Given the minimal context surrounding the word EREPATO on this tablet, it would seem, at least on the surface, that Ms. Leonhardt is perfectly justified in entertaining a newly coined translation that makes sense, once it passes closer scrutiny. So where context is minimal, I must grant Ms. Leonhardt the prerogative to translate this word as she sees fit. I posit that in the context of the Pylos tablet, bearing on craftsmanship alone, EREPATO can mean one thing and one thing only, “ivory”. Certainly not “slain in war” or “slain by Ares” or more properly “slain by Ares in war”, unless the translator of the Pylos tablet consciously sets out to radically change the meaning of almost all the other words, to force them to conform with his or her pet decipherment of just one single word on the Pylos tablet. But this is patently a very risky, if not outright dangerous, route to pursue, since it is bound to warp huge chunks of Mycenaean vocabulary way out of joint, the more and more one relies on it and pursues it to the exclusion of most if not all other impinging factors for any and all Linear B tablets one intends to translate. In this light, I would like to ask Ms. Leonhardt if she truly believes the Pylos tablet, of which the context is very precise, namely, the fine craftsmanship of chariot wheels, can be rendered any other way than it has already been. Is it even possible, let alone feasible and – I fear I must say it again -  practical or logical to pursue this method of decipherment of this particular tablet? With all this in mind, I really have no other choice but to invite her to do precisely that, i.e. to decipher this detailed tablet as she sees fit, and to come up with a really convincing alternate translation. When I say “convincing”, I certainly do not mean to me alone (even if it does convince me, even partially) but convincing as a practical alternative substantial version to the community of Linear B translators at large of the very kinds of things Linear B scribes were so bent on tallying, almost exclusively in the domain of inventories or statistics. 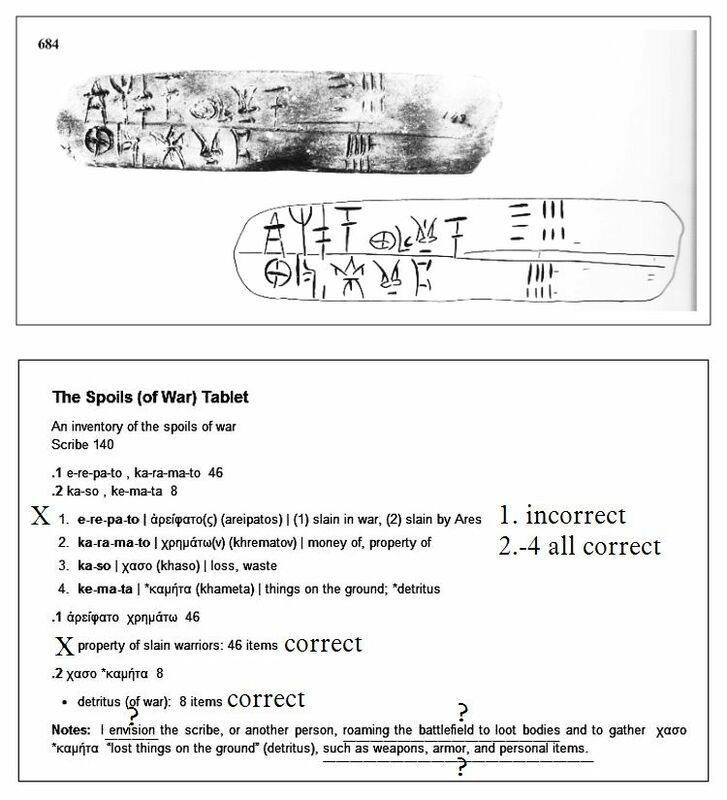 This brings us right to our next point, the overarching rôle of inventory keeping and statistical analysis which the Linear B scribes were fixated on, to the exclusion of practically any other consideration, almost without exception. I can hear Ms. Leonhardt proclaim, “But my translation is an inventory.”  Fair enough. But here lies the rub... an inventory of precisely what? To her mind, it seems pretty obvious – to a strictly military matter. But it is surely in this regard that the entire translation, let alone the rendering of EREPATO as “slain in war” or “slain by Ares” simply crumbles to pieces. And here is why. It is not a question of tabular context at all, since Ms. Leonhardt has frequently informed me that, to her mind at least, context is not an over-riding factor in the decipherment of any Linear B tablet. Again, fair enough. I’ll buy that, at least for the time-being. But what Ms. Leonhardt has failed to seriously take into account is the level or frequency of occurrence of Linear B tablets specifically and solely concerned with military matters as their primary focus. And I hate to say this, there is not one single tablet or fragment in the 3,000 (give or take a few) that I have meticulously examined from Scripta Minoa that deals with anything like something as specific as Ms. Leonhardt’s translation, relating  - and I emphatically stress – to sweeping up the spoils of war from the battlefield. Not even remotely. But there is more, a lot more to take into account. In fact, the pre-occupation of the Linear B scribes with sheep at Knossos and everywhere else is nothing short of obsessive. Once we get past sheep — I stress again — every other agricultural, economic area of Minoan society, in short, any and all concerns otherwise addressed by the Linear B scribes, at least at Knossos, all come a very distant second to sheep. The Linear B scribes were utterly obsessed with sheep, and the reason is obvious. Sheep raising and husbandry was squarely at the heart of the Minoan/Mycenaean economy. It was, plainly put, the underpinning of their entire socio-economic platform. Now, what really amazes is that not even the consideration of wool, which is the end-product of sheep raising, plays anywhere near the rôle as do the sheep themselves on the 3,000 tablets and fragments I examined. There are only about 100 tablets or 3.3% zeroing in on wool in the entire inventory of 3,000. The situation gets worse and worse, even where other areas of the agricultural economy are concerned, which is after all the real underpinning of Minoan society (however huge the sheep subset is). This includes all other livestock, pigs, bulls and cows etc. regardless. These tablets and fragments account for something like 50 or a mere 1.65 % of all Linear B media. When it comes to military matters, the situation is positively dismal. Of the 3,000 tablets and fragments at Knossos, only about 125 or a little over 4% deal with military matters whatsoever, all inclusively, from top to bottom, leaving nothing out, including the inventory of chariots as such, some 25 or about 0.8%, and then falling dramatically where the tablets and fragments deal specifically with things such as chariot wheels in working order or in need of repair, chariot bodies (5 as far as I can recall), horses etc. etc. And of all the tablets specifically dealing with military matters, there is not a single one which zeroes in on gathering the trophies and spoils of war. Not one. Why is this so? Well, I think one of the reasons for this state of affairs is that Knossos itself was a peaceful city, rarely, if ever involved in any wars (except when conquered by the Mycenaeans, if it ever was in the first place), to the extent that it was unwalled and practically undefended. Granted, even if we still allow for Ms. Leonhardt’s highly imaginative translation, the Minoan Linear B scribes at Knossos would have inventoried the spoils or war only for their Mycenaean overlords (if that is even who they were) and for no other reason. Inventories of the actual spoils of war would be of such little concern to the scribes at Knossos that the whole business would have amounted to nothing more than a hill of beans, if that. Yet nowhere else than on this single tablet KN V 684, if we are to grant Ms. Leonhardt’s translation the benefit of the doubt, are military matters the subject of any great concern on any Linear B tablet, except for fixing broken wheels and chariots and boring things like that. Come to think of it, practically everything the Linear B scribes so loved to inventory (at least at Knossos, where by far the greatest trove of extant tablets is found) sounds crashingly boring to us nowadays. But I put it to you, are not all inventories boring, even ours today? Yet the sole purpose of the Linear B tablets (with paltry exceptions few and far between) was to keep inventories on absolutely everything pertaining to the Minoan agri-economy. I have to say I was not prepared at all for their overwhelming obsession with sheep to the exclusion of so much else in their social fabric. In fact, I was astonished. But there you have it. Boring, yes, but to the Minoan scribes at Knossos, absolutely essential to the smooth functioning of their entire economy from top to bottom. Unfortunately, concern for inventory keeping for military matters was practically at the bottom of the barrel. Such statistical evidence, if we are to put our faith in statistics, and in the case of Mycenaean Linear B literacy, there is nothing else to rely on, greatly mitigates against the possibility, even remote, of the decipherment Ms. Leonhardt attributes to KN V 684. As you can see, it is just another boring inventory, in this case of smashed ivory, as opposed to the perfectly intact ivory on the Pylos tablet. But that is what inventories always are, nothing more or less, dull as concrete. This does not mean that they are not significant! They are in fact the only real-time indicators of the Minoan agri-economy we have to go on. I say, thank God the Minoan scribes at Knossos were hell-bent on inventories. The reason is apparent. The King or “wanax” of Knossos and his own subalterns, the overseers of the scribal community, positively demanded it. I am far from finished. Regressive extrapolation of archaic Greek vocabulary from the Catalogue of Ships in Book II of the Iliad, where the most archaic Greek in the entire Iliad appears, backwards to Mycenaean Greek actually seems to confirm (if we are to accept the premise of regressive extrapolation, and I do) that the word EREPATO in Mycenaean Greek is the exact counterpart of “elephantos” in Homer, which meant only one thing, “ivory” and not “elephant”. If you want to assign it the meaning of elephant too, that is fine with me. But in the context of the Pylos tablet above, that translation is silly. Given the strict application of “ivory” to EREPATO, I am strongly inclined to reject Ms. Leonhardt’s hypothetical “slain in war” or “slain by Ares” out of hand. And there is even more. In the entire lexicon of the extant Mycenaean vocabulary, there are almost no abstract words. This cannot come as the least surprise, since after all the entire purpose of keeping records in Linear B was to inventory everything and anything the Minoan scribes were obliged by their overseers to keep track of at all cost. The very presence of several words for overseer in Mycenaean Linear B (wanaka = king, damokoro = village overseer or mayor, qasireu = viceroy, korete = governor, opidamiyo = accountable village administrator, rawaketa = general & tereta = master of ceremonies, among others) serves to firmly underscore this phenomenon. Unfortunately, however, Leonhardt’s “slain in war” or “slain by Ares” flirts almost too closely, if not actually crossing the line, with the semi-abstract. In and of itself, this factor again mitigates against her translation of EREPATO. But it does much more than just that. It practically invalidates her entire translation, from top to bottom, because she makes the whole thing hinge exclusively on one word only, EREPATO, as she envisions it. The result is that her translation warps the meaning of the integral text of KN V 684 way out of whack. What particularly disturbs me is the summative, indirect way she translates the tablet. She does not translate it word by word, but instead comes up with a summary, an ideal translation as she envisages it, “I envision the scribe, or another person, roaming the battlefield to loot bodies and to gather... passim... (Greek words omitted) ‘lost things on the ground’ detritus such as weapons, armor and personal items.” OK, let us take a good hard look at this translation, which strikes me far more like a quotation from Homer than an inventory. (a) Why on earth would a Minoan scribe working exclusively at Knossos, just doing his job, which was solely to keep inventories, be wandering around in a battlefield to loot bodies and to gather detritus? This fanciful scene stretches my powers of reason beyond credulity. And since the Linear B tablets are concerned only with statistical inventories, and nothing else whatsoever, why would the scribes even bother to mention booty they themselves might have pilfered off some bloody battlefield (which, as I say, they never would have done), let alone from soldiers slain by Ares? What on earth did Ares have to do with looting battle fields?... and here I mean, in the scribe’s own mind, not mine. Probably bugger all, if you don’t mind my saying (and even if you do, I am just having a bit of fun). By the way, the word Ares does not appear in Tselentis’ huge Linear B Lexicon. (b) Can we really imagine that some bloodied, possibly injured, messenger or soldier from the battlefield would come barging into the office of a bunch of bureaucratic scribes half bored out of their skulls to report such esoteric, if not insignificant, information to them? They would either have been horrified at the intrusion, and summarily kicked him out or laughed at him. Not a pretty picture. (c) Such a herald or messenger would have been completely illiterate (analphabetic), and a member of a lower stratum of Minoan society. The scribes were the only literate people in that society, apart (possibly) from the nobility, and their sole function was to serve their overseers without question, not to kowtow to their own subalterns. (d) Now here the waters get really muddy. Why does Ms. Leonhardt tell us that she envisions, i.e. imagines this entire scenario, when all we are asked for is a straightforward decipherment and translation of what is ostensibly an inventory, period? The whole exercise of decipherment and translation of Linear B tablets cannot and must not be the demonstrable result of some imagined or fanciful notion of what the tablet appears to say to the mind of the translator, but instead must be the ostensible result of a thorough-going practical, logical contextual and, if at all possible, cross-correlated analysis of any and all tablets referring to any single Mycenaean word one wishes to translate. Otherwise, the whole exercise invalidates itself in a hopeless cycle of purely hypothetical, tautological reasoning, even if it is reasoning at all. Poetry is fine, as poetry. I am a frequently published poet myself. But inventories are as far removed from poetry as a stone is from God. Compare my own crushingly boring translation with Ms. Leonhardt’s, and you will instantly observe the multiple practical and eminently logical processes I followed to arrive at the run-of-the-mill inventory of smashed ivory that I did. First off (a) given the sparse context of KN V 684, it was even pretty much impossible to verify that EREPATO meant “ivory”. So we had to have recourse to another extant tablet, if such exists, which provides plenty of sound context for the very same word... which is precisely what I did by digging up the Pylos tablet illustrated above. And guess what? It means “ivory”. Period. I put it to you that of our two translations, taken as a whole, one or the other must be right, but certainly not both. I repeat: given the fact that Mycenaean words are almost exclusively concrete, preference for a concrete over an abstract translation of any Mycenaean word on any Linear B medium must take overwhelming if not absolute precedence over the (semi-)abstract. In fact, I would be willing to posit the relatively sound hypothesis, that translation of any Mycenaean word as semi-abstract or an abstract is fraught with so many difficulties, contradictions and loopholes that it is a risky venture at best. Unfortunately, Ms. Leonhardt’s translation of EREPATO suffers from all of these defects, and because of this, it in turn tinctures the connotation of all the other words she translates, even though her translations are technically correct. The real issue here is that she has taken all of these concrete words, which admit only of denotation, and turned them on their heads, so that taken all together, as an ensemble, as a sentence, if you like, they end up transformed into semi-abstracts with inherent connotations, thus essentially violating their own concrete meaning. It is a flat-out contradiction in terms. This, I venture to say, is a decided step backwards in the decipherment of any medium in Mycenaean Greek written in Linear B. Just read her translation, and you can immediately see that it is the product of her own imagination, rather than of a thorough scientific, linguistic analysis of the actual text, based on such principles as (a)(absence of) context, (b) cross-correlation to contextually (more) precise Linear B media in which context sets the matter aright; (c) with the Idalion tablet in the slightly younger cousin dialect of East Greek Mycenaean Greek, Arcado-Cypriot, composed in Linear C and (d) regressive extrapolation from the Catalogue of Ships in Book II of the Iliad, and other similar procedures. There still lacks but one final step, which is bound to nip in the bud the matter of the precise meaning of a great many Linear B words once and for all, and that is to resort to cross-correlation between Linear B tablets in Mycenaean Greek and Linear C tablets in Arcado-Cypriot. There are several reasons to adopt this strategy, which I cannot as yet do, as I am still trying to master Linear C, yet another syllabary, which bears no physical resemblance to Linear B, but for which the values of almost every single syllabogram and every single word are either practically identical with their Linear B counterparts, or very similar to them. The fact of the matter is that East Greek proto-Ionic Mycenaean Greek and Arcado-Cypriot are as closely related and as strikingly similar as are Ionic and Attic Greek some five centuries later, give or take. And there is more. Not only was Arcado-Cypriot written in Linear C (almost exclusively for about 700 years, from ca. 1100 – 400 BCE), it ended up being written solely in the Greek alphabet from ca. 400 BCE onwards, for reasons which we shall not enter into at this time. What happened then goes without saying. All of the Arcado-Cypriot Linear C tablets, including the extremely long famous Idalion tablet, a legal proclamation, were translated into alphabetical Greek. All of the vocabulary on the Idalion tablets and others instantly leaped into clear focus. The impact of this revolutionary development on the completely accurate translation of the entire vocabulary of the Idalion tablet is enormous. Once we know the precise meaning of the 100s of words on this tablet it is but one small step for man and one huge leap for mankind to cross-correlate the precise meaning of each and every Arcado-Cypriot word which has an exact or close match to its Mycenaean counterpart (and these are in the clear majority), to settle once and for all time the precise denotation of a large number of concrete Mycenaean words, the meaning of which is currently somewhat or seriously ambiguous or in doubt. I can at least assure Ms. Leonhardt that EREPATO is not one of those words, so she is safe on that account... at least for that word, but not for any exclusively concrete Mycenaean word which I successfully match up with its Arcado-Cypriot counterpart. And rest assured, there will be plenty. I do happen to know that the word for “physician” in Arcado-Cypriot Linear C and Mycenaean Linear B (iyate) is practically identical. So no matter how much any Linear B translator struggles to decipher it otherwise, he or she is bound to fail by default. In anticipation of a counter argument I suspect Ms. Leonhardt will advance, that plenty of words on the Idalion tablet are bound to be (semi-)abstract, given that it is a legal decree, I have only this to say. I simply would not even bother to take these words into account, as they would perforce invalidate my own procedure of cross-correlation. A rose is a rose is a rose. I hasten to add that I have read the Idalion tablet in the Arcado-Cypriot Greek dialect. 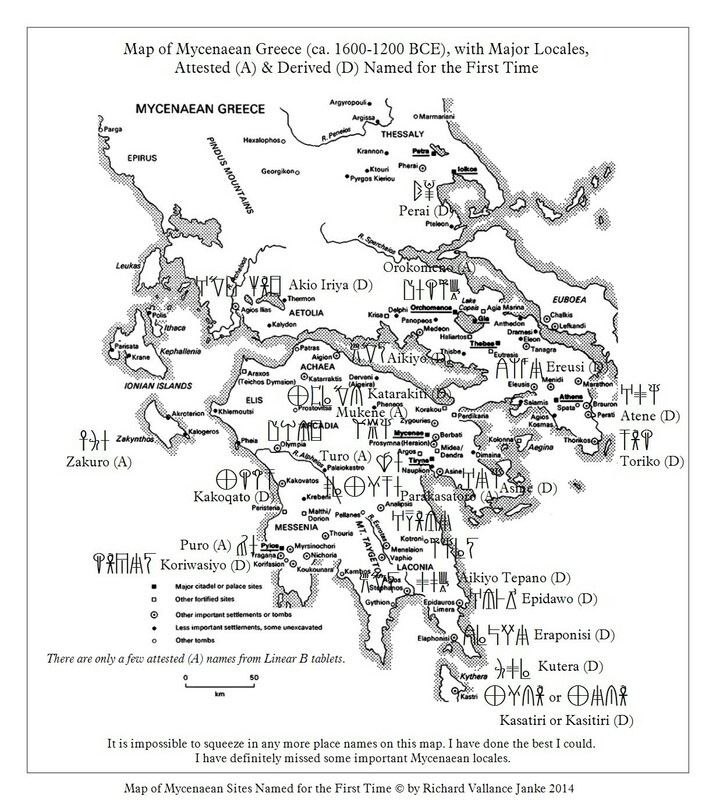 I am astonished that for the last 62 years no Linear B researcher, expert in decipherment or translator has even bothered to take into consideration the extremely close relationship between these two pre-Ionic East Greek dialects in order to extract the precise meaning from a (large) number of concrete, denotative Mycenaean words, just as one would extract a tooth, let alone that anyone would take the next obvious step, take the trouble to learn Linear C, read the Idalion tablet in both Linear C and in Greek, and methodically have at it, surgically analyzing and cross-correlating every single concrete word on the Idalion tablet that (nearly) matches up with its Mycenaean Linear B equivalent. This is precisely what I intend to do, to lay to rest any lingering doubts about the meaning of (hopefully) a substantial number of Mycenaean words, and again to cross-correlate the results of these translations to a great number of other (similar) Mycenaean words, based on the orthographic conventions & the syntactical structure (so often identical) of both of these dialects. Once we have the alphabetical version of any concrete Linear C word matched with its Linear B counterpart, it is but one small step to applying the same or similar orthography to its Mycenaean equivalent, let alone to firming up the precise meaning of the word in both dialects. This is going to be hard work, but a lot of fun, because I am more than just reasonably certain the overall results will shock the daylights out of the Linear B research community. For the time being, I am not going to bother targeting Ms. Leonhardt’s heavy reliance on the West Greek Doric dialect, which bears little resemblance to the East Greek proto-Ionic dialects, Mycenaean Greek and Arcado-Cypriot, since this factor does not directly impinge on the validity or lack thereof of the translation in the context of the methodology by which we are here considering it. This analysis will have to wait until a later post, as it also will require my strictest attention to most of the vocabulary Ms. Leonhardt translates on at least one Linear B tablet. The Linear C Syllabary used to write in the Arcado-Cypriot is entirely different from Linear B (except for a very few syllabograms, Linear C LO = Linear B RO, C NA = B NA, C PA = B PA, C SE = B SE  & C TA = B DA, which look similar to or the same as their Linear B counterparts, but almost certainly by accident). It is very important not to be confused by the fact that Linear B has only a R+ vowel syllabogram series, while Linear C has only a L+vowel series, because in fact they are the very same series. Recall that the Japanese cannot pronounce a pure L or pure R. The same phenomenon occurs with the Mycenaean & Arcado-Cypriot dialects, but only half way. 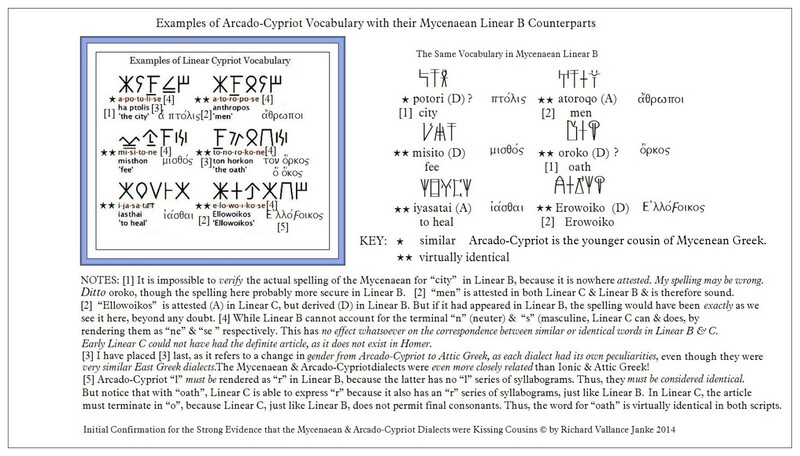 The Mycenaeans could not pronounce the consonant L, which clearly explains why they only had the R syllabary series, which had to make do for both L & R + the vowels a e i o u, while Linear C had the exact opposite problem, where the L syllabary series had to make do for both L & R + the vowels a e i o u. Again, a slight variation of the same phenomenon occurs with the Arcado-Cypriot T syllabary series, which which had to make do for both D & T + the vowels a e i o u, because the Arcado-Cypriots apparently could not pronounce the consonant D. Compare with Mycenaean Greek Linear B, which has both the D & T syllabogram series, for the simple reason that the Mycenaeans could pronounce both of these consonants, while apparently the Arcado-Cypriots could not. All of this boils down to two things: (a) that the Linear B & Linear C syllabaries are entirely unrelated in appearance alone & (b) that, in spite of this, the syllabograms in both Linear B & Linear C all represent precisely the same consonants & vowels, in spite of minor differences in pronunciation (cf. above). This means that once you have learned the syllabograms for both Linear B & Linear C, the underlying morphemes or words must be (almost) the same in both dialects, again with minor differences in pronunciation. For instance, the word IYATE (or IJATE) has the exact same meaning in both dialects = “physician”, in spite of the fact that the syllabograms in Linear B bear no physical resemblance to those in Linear C. Note that there are no logograms or ideograms in Linear C. The scribes simply did away with them as spurious. But this has no effect whatsoever on the phonemic values of the syllabograms in both dialects & in both syllabaries, which are almost always identical, except in those cases where pronunciation in one dialect prohibits the exact same pronunciation in the other, as explained above. Yet even where the pronunciation differs in each of these dialects, this difference is of no real consequence. Take for instance, this. Any possible ambiguity in the meaning of the word, IYATE, in Mycenaean Greek, has now been resolved once and for all, and simply vanishes. I happen to know this for a fact, because I took the trouble to learn and read the Linear C version of this word in Arcado-Cypriot, which just so happens to be identical to its Linear B counterpart. And in case anyone chooses to protest, “But how can you be sure that the Linear C word does mean ‘physician’?” The answer to that is as plain as the nose on my face. The Idalion tablet was translated, word-for-word, from Linear C into alphabetic Greek in the fifth century BCE. Problem solved. No hay más problema nada. The ambiguity is resolved once and for all. It simply vanishes. You can see where I am going with the ball. The Arcado-Cypriot dialect is the younger cousin of the Mycenaean Greek. They are both East Greek Proto-Ionic dialects as closely allied to one another as the much later Ionic and Attic dialects were. The implications of this extreme similarity are bound to be nothing short of definitive where the clarification of (much) more accurate definitions of Mycenaean words is concerned. More on this below. As can be instantly seen, Linear C came to the forefront ca. 1100 BCE, a mere 100 years, give or take, after the disappearance of Linear B from the scene. If we must insist on categorizing Mycenaean Greek as prehistoric, we are bound to fall into a trap from which we cannot extricate ourselves. Allow me to explain. Let us assume for the moment that Mycenaean Greek and its syllabary are prehistoric. But what about the Linear C syllabary? Can it be considered as prehistoric? The answer to this question is a flat no. The Linear C syllabary was in continuous use from ca. 1100 BCE to ca. 400 BCE, when the Arcado-Cypriots finally caved into the preeminence Attic Greek was then assuming all over the Greek-speaking world, and finally abandoned Linear C.
However, and this is the key to the entire mess, if Linear C was a historic script (as it mostly certainly was), then at the very least Linear B should more properly designated proto-historic, and along with it, Mycenaean Greek itself. Several historians nowadays have already adopted the position that indeed the entire Minoan/Mycenaean civilization, when Linear B was their sole script, was proto-historic, and not prehistoric. The label prehistoric can only be applied to civilizations for which we have no deciphered written record. This applies to pre-Mycenaean Crete and Knossos, since Linear A, the script the Minoans used for their as yet undeciphered language was in use. Until Linear A is deciphered (if it ever is), we really have no choice but to regard the Minoan civilization prior to the advent of Linear B as prehistoric. However, to put a fine point on it, it is questionable at best to regard the Minoan/Mycenaean civilization as actually historic, while it is probably sound to call it proto-historic. Here is why. 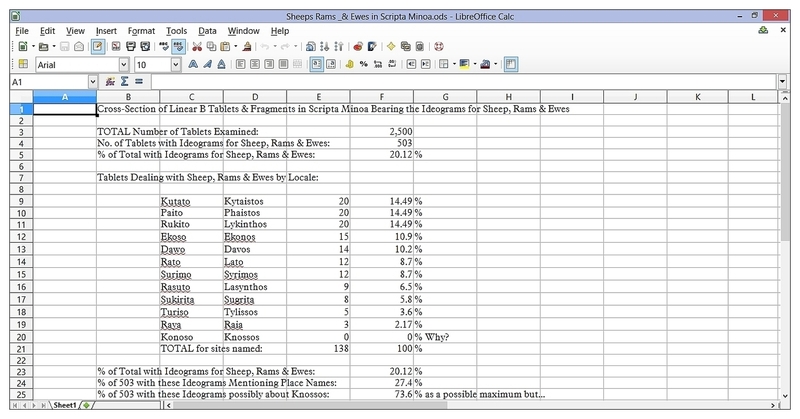 While Linear B was almost exclusively used for statistical inventory keeping, which might best be categorized as proto-literate, Linear C, on the other hand, was a literate script, since the Arcado-Cypriots used it, not for statistical inventories (far from it) but for legal documents and decrees. In other words, with the advent of Linear C, we enter into the age of  Greek literacy, in which words begin to acquire significant connotative, abstract value, as opposed to merely denotative or concrete. If we accept this hypothesis, and I for one no longer question it, then the historical gap between proto-literate Linear B used for Mycenaean Greek and literate Greek, of which the earliest exemplar was Linear C for Arcado-Cypriot, is indeed only one century and not four. Linear C was a huge step forward from Linear B. One of the principal underlying characteristics of these two scripts is that one (Linear B) is almost totally denotative and concrete, whereas the other (Linear C) is both denotative and concrete, and connotative and abstract. In a nutshell, this means that Linear C is without a doubt a historic script, whereas Linear B is not (quite). This is why some historians and linguists specializing in ancient history choose to call Mycenaean Greek and its script, Linear B, proto-historic. You can definitely count me among them. Now comes the clincher, the one factor that decisively favours Linear C as a historic script for writing ancient Greek. I have already addressed it. When Linear C was finally abandoned by the Arcado-Cypriots ca. 400 BCE, they did not simply cast aside all their documents in Linear C from the previous 8 centuries (! ), which would have been completely insane, but did something quite remarkable instead. Since to them the famous Idalion tablet, which was actually composed in the fifth century BCE at Cyprus (yes, the script spread that far! ), they knew they simply had to preserve the original in Linear C. The Idalion tablet is not a product of early Linear C, centuries earlier, when it first came to the fore. Now we arrive at the very last step in our analysis of Linear C as a historic Greek script, and of the Idalion tablet itself as the primary source emblematic of the script itself. The very fact that the Cypriots who wrote the thing in Linear C in the first place considered it absolutely essential to translate it in its entirety into alphabetical Greek speaks to their over-riding concern that the extremely significant content of this precious tablet be preserved both in Linear C and in the Greek alphabet. In other words, the Linear C (original) version of the Idalion tablet was as essential to defining the literary heritage of their advanced culture as was its Greek translation. It was a treasured document to them in every sense of the word. But why translate it into alphabetical Greek when they could easily read it in Linear C? — the answer sticks out like a sore thumb — for their descendents, who within a couple of generations would no longer be able to read Linear C at all. But that fact does not in the least detract from the fundamentally extreme historical significance of the actual tablet. I am not finished. Since Michael Ventris successfully deciphered Linear B in July 1952, no translator of ancient scripts, in this case, syllabaries, has ever bothered cross-correlate the vocabulary of Mycenaean Greek composed in Linear B with the vocabulary of Arcado-Cypriot in Linear C and — I hasten to underscore — as well as in alphabetical Greek in the 4th. century BCE, a mere century after its composition. It simply flabbergasts me that no-one has. Since the Proto-Ionic East Greek dialects, Mycenaean Greek and Arcado-Cypriot are as closely related as Ionic is to Attic Greek, the necessity of cross-correlating the vocabulary of the slightly younger dialect with that of its forebear, Mycenaean Greek, becomes imperative. Another highly significant point: while Linear C started out as a proto-Ionic dialect, most probably largely denotative and concrete like its immediate predecessor, Linear B, not only did it change but little over the span of eight centuries, but it actually ended up being a quasi-Ionic historical dialect by the time the Idalion tablet was composed in Linear C in the sixth century BCE (and probably well before that). So then, if the same script is both proto-historic and historic, this begs the question, which is it? I leave it up to you to decide, but as for myself, it is both at the same time, even though it was proto-historic for the first few centuries (how many I cannot determine) and subsequently historic from the sixth century onwards. But where do you draw the line? Well, that is up to you, I suppose, but I don’t see any point in the exercise, because it ended up as historic. Simple as that. This is precisely the reason why I intend to master Linear C, and to read the entire Idalion tablet — I stress gain — in both Linear C and in Greek. In fact, I have already read it in alphabetic Greek, so I am very familiar with its legal contents. Now here comes the cruncher. Since we know exactly what every single word means in the alphabetical translation of the Idalion tablet, we also know precisely what every single word, word-by-word, means in the original Linear C. The implications of the bilingual text are nothing less than immense, and I would dare say, revolutionary where Mycenaean Greek and especially its syllabary, Linear B, are concerned. The reason is obvious. For the time being, we are unable to zoom in on the precise meaning of a great many Mycenaean words, let alone decide between one interpretation of their meaning and another or still yet others, because of the (so-called inherent) ambiguity of the phonetic values of so many of the Linear B syllabograms. I cannot delve into this quagmire in this post. There is simply no way to do so without doubling or tripling the length of our discussion. However, in our blog, I have several times addressed the issue of the ambiguity of every syllabogram in Linear B which can be interpreted in more than one way. You can refer to those posts for a thorough analysis of the ambiguous nature of the Linear B syllabary. I have even published complete charts of every possible variation of all the vowels and every syllabogram affected in each and every one of the aforementioned posts. But that is not our primary concern here. It is rather this: given that the alternate pronunciations for each vowel and for all of the apparently ambiguous syllabograms in Linear C have been largely resolved thanks to that timely translation of the Idalion tablet into alphabetical Greek, cross-correlation of alternate values, where applicable, between Arcado-Cypriot and Mycenaean Greek, which are after all cousins, is bound to resolve, once and for all, the actual alternative values of all the vowels and a great many, if not the majority of syllabograms in the latter, at least for shared vocabulary. That this constitutes a huge step forward in the generic clarification of a large chunk of Mycenaean vocabulary almost goes without saying. For the past 62 years, too many — I would even venture to say —  far too many Mycenaean words have been open to multiple interpretations, some of which are very likely to be plain wrong. But cross-correlation of every single word on the Idalion tablet, the meaning of which we definitely know beyond a shadow of a doubt, with any and all Mycenaean words that are found to be (almost) the same as their counterparts on the Idalion tablet is bound to resolve a great many ambiguities in Mycenaean Greek once and for all. This is why I have unequivocally decided to do what no translator-researcher in Linear B has ever bothered to do to this day, and that is to master Linear C to the same extent as I have Linear B, and to set out on the road to resolving as many of the ambiguities of the Linear B script as I possibly can. And I know I eventually shall. I have not the faintest idea why practically all researchers and translators specialized in ancient history have never bothered to learn Linear C, but if anyone who visits our blog has done so, I beg you get in touch with me and let me know, because I shall need all the help I possibly can muster even to lay the basic groundwork for such an enormous undertaking. My aim is nothing less than to take the astonishingly comprehensive accomplishment of Michael Ventris and his mentor, Dr. John Chadwick, one major step further, and to resolve as many of the ambiguous remnants of Linear B as I possibly can — or should I say, we possibly can, if there is anyone out there in outer space who is willing to come to my rescue. What I fear more than anything else is that there are unquestionably so very few individuals who can read Linear C. If that is so, then may God help us, as I have the implicit faith He or She will. This post took me 8 hours to compose. Please tag it LIKE if you like it.